Heard a strange noise and died. The wolf was very clumsy and looked like he was drunk. "Tigerpelt!!! Help us!!!!" suddenly a giant invincible unkillable tiger emerged from the shadows. "Fiiiiiiiiine..." she sighed. She quickly killed ye hawk. Then she ran away, never to be seen again. Who the heck is Tigerpelt???????????? Do not mess it up-but let the attack continue, we should still have this because it is like a fun little break for us writers! Was completely destroyed because ppl spent too much Time on reaction stories instead of the actual rp!!! thunderclan was like, omg what are we gonna do? so then Firestar came back to life since he is a leader after all, and he was really angry so he started attacking the cow-wolves. The clan was inspired and soon there was a war going on. But then Shadowclan for once decided to be helpful since they were bored and wanted to fight. 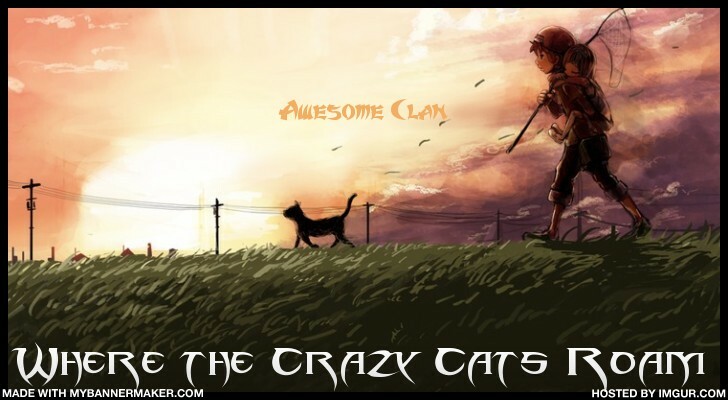 Shadowclan then cursed at the thunderclan cats while darkstripe had fun flipping in middair. River and Wind can still be continued. Stormclan burst in, their giant wolf bodies with wings soaring throughout the skies. The leader, Aurora, best friend of the tiger, surveyed the damage and her loyal subjects. Her herald, Mist, howled the warning call and announced, "Subjects of queen Aurora, harken to her voice." and queen Aurora spoke: "Fourscore and seven hers ago. Our dinosaur fathers brought forammals onto this new earth, conceived in liberty, and dedicated to equality. Being peaceful creatures, I order you to stop." Aurora & Stormclan=DEAD! HOORAY! They were annoying. Ravenpaw=Mastermind of Earth! Ravenpaw died of heart failure. The End. Sotrmclan jumped up from the dead and laughed. "Silly gooses, we can't die!" This is getting funny. CONTINUE OR DIE! "NO ONE CARES! NOW GO JUMP INTO A DITCH AND DIE SOME MORE!" shouted Ravenpaw. Meanwhile, Shadowclan and Thunderlcan had agreed on a temporary peace treaty and then began waging an all-out war against the cow-wolves below. They bombed them all and killed many-friend and foe. Actually they moght have killed more friends then foes-OOPS! The Tribe of Rushing Water continued to float up into the sky and then went so high that some dissapeared and became stars-or died of lack of air. Then Brooks flying kits, Lark and Pine flew and said that they were angels from above and said that they would guide them to safety, so they flipped over the hot air balloon and the Tribe of Rushing Water crashing down on Ravenpaw and Stormclan and the cow-wolves. During the fall a lesser known cat known as Sheer Path Beside Waterfall landed on Ravenpaw and his heavy weight crushed him and killed him and broke his heart. Also Crag Where Eagles Nest fell on Aurora who had been revived and killed her and crushed her heart. Then he became a wanted cat as Stormclan pursued him through the mountains. He went to the intruders camp but they were all dead and saw Swoop of Chesnut Hawk who he thought had been taken away by an eagle and saw lots of rocks. She then said she had been taken to its nest and then a huge floating roc came, and said that rocs the birds are actually giant floating rocks! She was taken away and was worshipped by them in their camp-the Stonehedge. She was the fabled goddess Rockella and would rule over them. She led them into battle and killed off the intruders and then went in to say they have really good food-but Crag wanted a place to find so a roc offered to help him and he his underneath the roc and then it crushed his bones. She then said that everyone becomes very stupid around them except the goddess. Then Stormclan arrived on the scene, but because of the rocs they forgot what they were doing and then left. Stormclan looked around, and decided to destroy everything in sight. Gotta go! Be back in 10 mins. Do you like the new pic at the top? Awesomeclan is way different now. Ordered them all to stop with a big sweep of his paw that blew them to a stop.! "This wasn't mean't to happen!" He shrieked. "We were..."